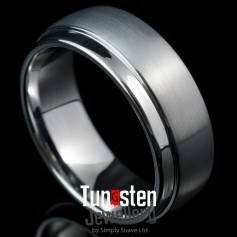 Remind yourself of an eternal promise with this Tungsten Celtic ring. A symbol of an eternal vow and a timeless love, this stunning DUNHAM ring can be a wedding band or a promise ring. The timeless knots featured on a tone of colour that gives off a completely different note. Give this to a person that means the world to you as a promise of togetherness that spans the ages. Pleasae note this is a discontinued style and is only available in limited sizes.